My client is not the first to have asked me “Do you see what I see?” About two years ago, a pastor from a church on the Drag once informed me that he had come upon a group of clients praying. Someone had just gone to the hospital, and a group was sitting and praying, some distressed and crying and others leading a prayer. The pastor had never seen this before. All the credit goes to God’s glory, but we began teaching our clients how to pray every week almost four years ago. We also placed emphasis on taking prayer requests from them and sharing them with prayer warriors. We have poured countless hours into nurturing their prayer lives so they feel comfortable sharing with God… their needs, the good times, the bad times, and the ugly. And God has changed their lives. 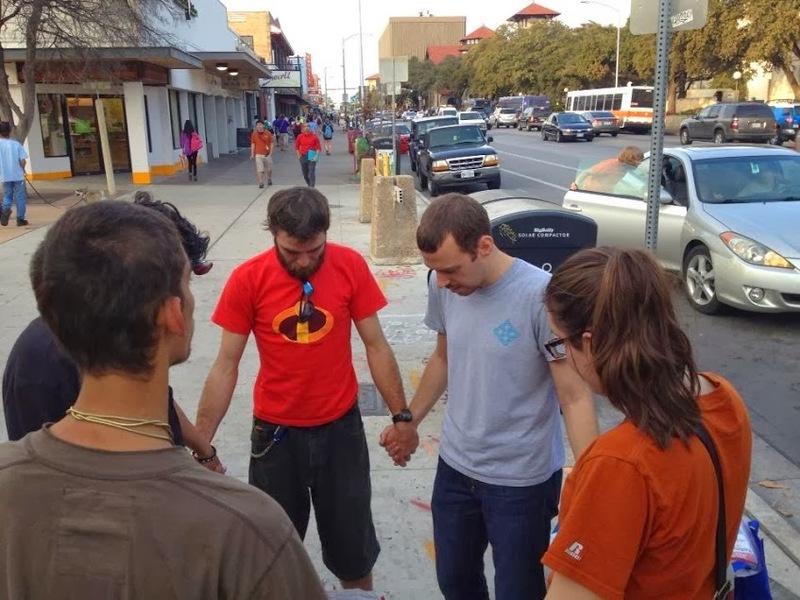 A pastor that I meet with for supervision remarked during one of our sessions, “I have to stop and simply give praise that the street youth have become a praying community.” It was a very promising sign. Do you see what I see? Tommy’s news promised to be even better! Many street youth have come to Christ over the years. We know because they write to us from wherever they have settled down and tell us about their successes and transformation. But lately, we’ve seen clients come to know Christ on the street. Again, all the glory goes to God. Many people work with street youth in their daily lives and it is always our goal to get them plugged into local churches. The people we have poured into for years have become saved! But even more is going on. I want you to see what I see! There are at least five clients who are regularly going to local churches and sharing their faith on the street. One is a Saul-to-Paul story of intense persecution of Christians until his conversion. Another is a story of black-arts magician to Christian. One was a drug-crazed person constantly going to jail and now is totally transformed. Another is the story of a shy young lady who could barely speak in public now sharing her faith openly. And Tommy is a man healed, once crippled by mental health issues and now fully in love with God and loving others. God has met each of these people with his transforming power. Oh the joy of seeing what I see! And fruit has begun to multiply. I couldn’t be more excited that these people are taking their street friends with them on Sunday, and helping them receive the Gospel. At least one more has been baptized through their work (and is now away at a rehab). Another has renewed her faith and joined them in spreading the Gospel. Do you see what I see? I can hardly believe my eyes! It is so wonderful to see the strength of these young people turned into Gospel tools for His Kingdom. Thank you so much for being a part of this! I was walking on our Friday mini-mission trip with a volunteer talking. I saw someone I thought I recognized about a half-block up. I suggested that the volunteer allow me to approach the person alone because the person I thought I recognized is sometimes very angry. I couldn’t have been more mistaken about who I saw. The musical 6 foot 8 young man grinned ear to ear and shouted, “Well hello, Terry! I was hoping to see you! You probably don’t remember me, but I’m Jason.” I could hardly believe what I was seeing. For you see, it was the same man outwardly, but there was nothing the same about him. He was peaceful, happy, and full of joy. He told me where he had been for the past year or so and why he was traveling and street-dependent again. He gratefully took a few things and bragged about how he tells everyone what great work we do, wherever he goes. And then he said goodbye. I stopped him and asked about his faith, because I had a hunch. Sure enough, he told me he had hit rock bottom about a year ago and have found a new life in Christ! I asked if I could give him a hug and he grinned ear to ear and dropped his pack to the ground. I once again feared for my safety as he bear-hugged me. Thankfully no ribs were cracked. What a wonderful difference faith makes. We cannot fix anyone, but faith can cure anything through God. We are so happy to see someone find their way home to Christ’s loving arms. The first time I saw him, I was afraid. He had wild hair, talked to himself in an animated way, and didn’t make eye contact. It took me repeated times to work up the courage to speak with him. But it was the beginning of something surprising. Nick had come from Dallas and was living on the streets. He didn’t have any ID because he had left it at his previous place of residence. He kept his money in his shoes. We served him a street lunch every Friday for weeks. Unfortunately, Nick began to change. He got wilder and began using drugs. His hair grew into artful dreads, with a few ornaments inserted. On several occasions, we found him passed out or overdosed, and he went to jail many times as well. But recently I found myself sitting in prayer time, and Nick was the only participant. I figured God had cleared our everyone else for a reason, so I kept asking questions. Soon, Nick was telling me his whole story. It started out typical for a large segment of my clients: he lived at home with his mom. After puberty, his mind began to betray him. He suffered from delusions and visions. As a 17 year old, he felt that the medications he took almost destroyed his personality, and so he stopped taking them. He learned that heroin somehow helped his mind become calmer. To mediate the heroin, he began to use cocaine. These things led to his leaving home, living with a girlfriend, various drug addictions, criminal offenses, and eventually going to prison. In prison, Nick joined a brotherhood and learned Islam. As a young man, mostly without medication, and mostly without drugs, he survived seven years in prison. Upon his release, he lived in a halfway house in Dallas. Without help with his transition, Nick found that he couldn’t live by the rules and left one night. That’s when I met Nick in the streets of Austin. During prayer time, Nick expressed a desire to get his life together. After hearing his whole story, I realized this would be a completely new life for him. And so, we made a plan. First step was to review his taking his medication again. Nick–typical of many of my clients as they reach brain maturity at 25–was willing to reconsider medication. He knew how to get them from MHMR. The next step was getting his disability benefits started. We agreed that, for now, Nick was in no shape to work because of his mental challenges and lack of soft skills. We hoped that eventually he will go back to work, but for now, God might provide for him through disability benefits. Nick wants a place to live, where he can do his art and music. And so again, we developed a plan. I left Nick to take the first steps, and I got his permission to follow-up regularly to see if he’s doing it. After that, I asked Nick about his Muslim beliefs. It turns out that Nick believes in Jesus today. I explained the Gospel and asked if he understood it; he did. Then, we prayed that God would reveal himself more fully and that Nick would begin trying to live a new and grateful life as a Christian. Since our conversation, I have seen Nick many times. He has obtained medication. He has applied for disability. He is exercising great restrain to stay away from damaging drugs and activities. And he is trying to walk closer with Jesus. According to Nick, it’s difficult. He told me the other day, “I need to take a vacation. This is hard.” And I understood him. Rebirth is not easy. Renewal is not usually immediate or occurs overnight. It requires patience, strength, endurance, and strong faith. I don’t know what the future holds for Nick, but I am so privileged to walk alongside him. It’s a time for rebirth and renewal. I pray you see it in nature. I pray you see it in your faith, community, and even in your family. Furthermore, I pray you sense renewal in your personal life. It’s a privilege for me to be your representative in this work! And, together on a daily basis, we can encourage people who are often ignored, invisible, and unwelcomed. Thank you for your support.